Does your warehouse have inventory inaccuracies? Need to keep track of expiration dates on medications? Today’s pharmaceutical and medical product industry is growing at an increased rate across the globe and is measured closely. Since traceability is an important factor in this industry, warehouse companies must optimize their supply chain to decrease costs and increase profits in a competitive international marketplace. To ensure your business is capable of ensuring optimization, we are providing you with our innovative, pharmaceutical enabled Warehouse Management System using Wireless Warehouse In A Box™. Let’s work together by doing our part in fixing the drug shortage issues of North America. Pharmaceuticals are highly sensitive to their unique handling requirements; our management software has been developed to standardize these requirements. 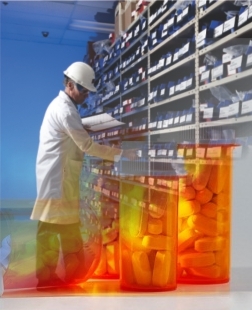 Our warehousing software solution provides a powerful warehouse inventory location system, assisting you in retaining inventory control over your pharmaceutical and medical products to meet both regulatory and market demands of the supply chain. Our leading solution, Wireless Warehouse In A Box™ enables your warehouse with ability far beyond your standard track and trace software. We take it to a visual level. As the Pioneers of Visual Pick Technology, our WMS is integrated with software allowing you to visually confirm and validate inventory contents through pictures of the product as well as their exact highlighted location in the warehouse. Our goal is to ensure that your company meets compliance standards protecting consumer lives and your brand.